What2Learn » Make fun interactive hangman games online for FREE! Make fun interactive hangman games online for FREE! 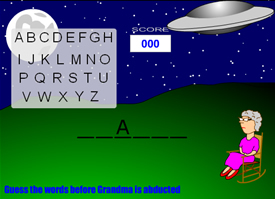 Quickly and easily create fun interactive hangman games – no download required! Hangman has always been a popular way to help kids develop vocabulary knowledge and literacy. Not only is it educational but it is also a fun activity. You can use our FREE learning game generator to make three different interactive hangman-style games. The Flash-based games can be stored as a bookmark on your browser, linked to from another site, embedded into your own VLE or website or even added to the main content within What2Learn. The added advantage of this last option is that you will be able to see the scores your student get in this game. Try the sample game below or create your own balloon ride hangman game. All of the words in the game below are to do with volcanoes. 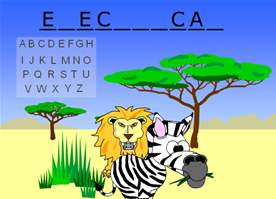 Will you guess the word and save the zebra in time? Will you guess the word and save Grandma before she gets beamed aboard? Anybody can make these games – all your need to do is fill in eight boxes to give the words you want in your game and we will do the rest. You can make lots of other types of educational games using our free game generator. 2 Responses to Make fun interactive hangman games online for FREE!